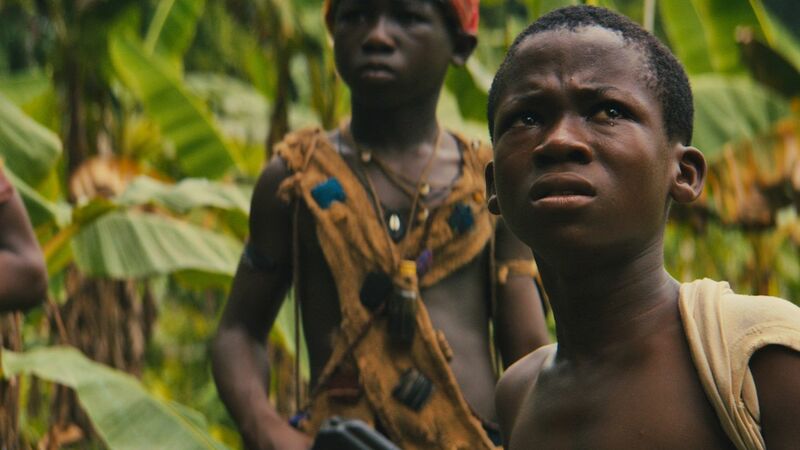 In an unnamed West African county, an adolescent boy named Agu (Abraham Attah) enjoys a cheerful, mischievous life with his family in their village, away from the dangers of an ongoing civil war. Their idyllic world changes when armed forces enter into the buffer zone where they reside. In the chaos, they are torn apart, and Agu finds himself alone and scared. A group of fighters, comprised of both men and boys, and led by an individual named Commandant (Idris Elba), stumbles upon him and forces him to join their ranks. As Agu witnesses and engages in the horrors of his new lifestyle, he reminisces about his past and tries to preserve what’s left of his soul. The film isn’t an easy watch by any means, but what’s exceptional about it is how Cary Joji Fukunaga – who wrote, directed, and shot this picture – adheres to the story’s humanity. He’s not interested in highlighting the acts of violence; instead, he mostly keeps the perpetrators and victims in the frame, focusing on their emotions. His decisions to not elaborate on the battles and even the sexual violence are surprising and welcome, as we can easily glean all that from the characters’ actions. Nevertheless, those decisions do have their drawbacks. Fukunaga does linger on some scenes a little too long for comfort, and the film does drag from time to time. It also takes a surprising direction in the third act, and I can imagine that’s where some viewers may feel underwhelmed or even cheated. However, that storytelling choice falls within the borders of a character study, which is ultimately what the film is. This tale is all about the effect that war has on identity and the psyche, and Fukunaga explores that delicately through the characters of Agu and the Commandant. The fact that Agu is such a young boy is never lost on us, and it plays out in scenes of both combat and calm, where one moment he could be shooting people and another moment playing games with other child soldiers. His increasing self-awareness heightens the deterioration of his innocent mind, brought to life by bursts of his brooding, numb internal monologues. As despicable as the Commandant is, Fukunaga slowly reveals just how damaged the character is beneath his authority and swagger, and he too becomes someone to perhaps pity and even sympathize with. As Fukunaga focuses on the characters’ humanity, a duo of bright performances swoops in and makes it tangible. Newcomer Atta is a revelation, as he proves his maturity by establishing a firm screen presence that holds for the film’s entire duration. He handles the intense scenes with ease, and he’s also utterly convincing with every step of Agu’s twisted journey. Absolutely magnetic as the Commandant, Elba imbues his performance with charisma and eccentricity aplenty, bringing depth to what could have been a one-note character. 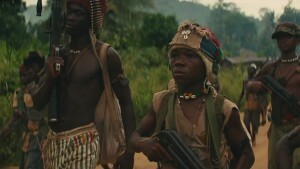 Not just content with taking us into the mind of a child soldier, the film also brings us into his world. Quite refreshing here is the variety of colors in each frame and how they pop. I’ve become used to the blue and orange palette seen in most films nowadays, so to see colors other than the two mentioned – like green and red – is quite nice. Fukunaga goes even further by deeply saturating the colors in one haunting sequence to mirror the effect that drugs have on Agu’s mind, lending a dreamlike quality to the picture. The director is also well known for his use of long takes and tracking shots in his filmography, and he uses them quite skillfully here by framing the characters’ relation to their surroundings. 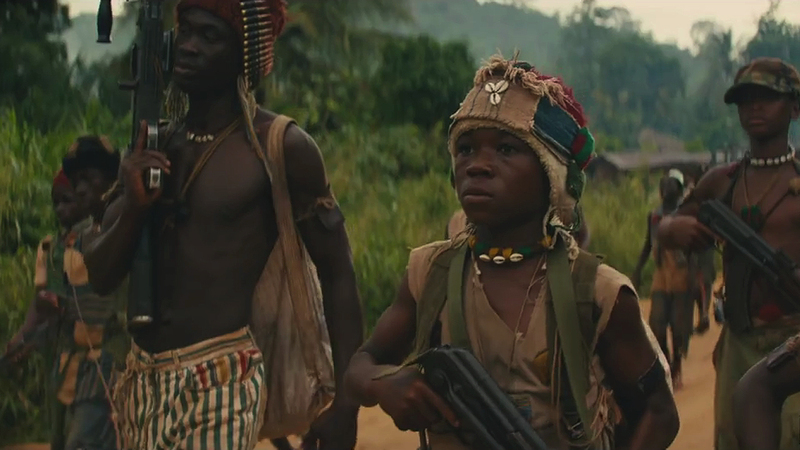 Anyone who has access to Netflix should make watching Beasts of No Nation a high priority. Not only is it a tremendous filmmaking achievement for Fukunaga and his cast, it’s also a film that reminds us of the fact that this story, while fictional, is a reality to thousands of children in regions similar to the one being portrayed. This isn’t just cinema; it’s also an opportunity for activism.